Doula support services during the birth: pain management through massage, counterpressure, aromatherapy, soft music, emotional support, etc. I’m leaning towards Doula #1 in spite of the higher price tag. While the cons balance each other out, she has more pros. I could certainly buy a lot of baby stuff with an extra $400, but I’d also really like professional birth photography, and hiring even a cheap birth photographer would probably be another $200-$300, and then I’d have another person in the labor and delivery room. For the record, Doula #1 has 14 years of experience, while Doula #2 has 2 years of experience. I know I have fewer regular readers than I can count on one hand, but any feedback? Personally, I just make my husband take the birth pictures, and he’s not that great of a photographer (I take 90% of the pictures at our house). They turn out well enough for our purposes though, and they are practically free. Now, when we got married, my father in law spent close to $2000 on pictures. They were very well done, and we are quite glad to have them. Thing is, other then a small handful, we haven’t looked at them more then twice since our first anniversary. Would I pay that much for pictures that I hardly look at? I don’t know. If I had money to burn, I think it’s a great way to spend it. If I don’t, I think there are many better uses. Bottom line, I don’t think that I would use picture taking as the sole purpose of choosing Doula #1. Her experience, however, would definitely be something more in her favor. I think, in this instance, go with what “feels right” to you. Yes $400 is a lot of money, but if she feels right to you and “fits” better, then that is really important. This person will be intimately involved with the birth of your baby. Yeah, I think I will go with #1. Going to wait until Friday (to get my initial amnio results back and make sure I’m out of the woods on having an amnio-miscarriage), then ask #1 if she’s still game. 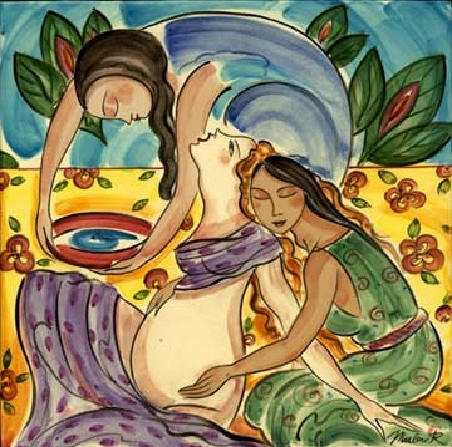 I just extended a job offer to doula #1, and she has accepted. She’s coming to my prenatal appointment on Monday morning to meet my hot doctor, sign her contract, and do our first prenatal visit. Super-excited to have her. She seems great, and I will probably give her the link to this blog after she’s signed and paid, so maybe she will comment eventually!